← What Qualities do Women Want in an OBGYN? Polycystic Ovary Syndrome (PCOS) is thought to be one of the most common endocrine abnormalities in women, affecting between 6.5-8% of all women. Clinical features include menstrual dysfunction, hyperandrogenism (increased amount of male hormones), polycystic ovaries, metabolic problems, and an increased cancer risk. Menstrual dysfunction shows itself as infrequent or absent ovulation. This can result in infertility and need for ovulation treatment for those wanting to conceive. The menstrual pattern is typically fewer than 9 periods a year (oligoamenorrhea) or no periods for three months or more (amenorrhea). Hyperandrogenism is characterized as acne, hirsutism and male-pattern hair loss. Depending on which androgens are measured, 50 to 90 % of women have elevated androgen levels such as total testosterone, free testosterone and DHEAS. 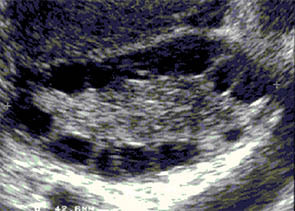 Polycystic ovaries are seen by ultrasound and usually show 8 to 10 small follicles in the periphery of the ovary revealing a “string of pearls” appearance. Metabolic issues can include resistance to the effects of insulin, greater insulin levels, obesity, and a greater risk of Type 2 Diabetes. If the condition is not treated over a long period of time the result of too much estrogen can cause an increased risk of endometrial hyperplasia, which can lead to uterine cancer. PCOS treatments are very helpful at reducing the symptoms and risks of this condition. The right treatment can lead to a normal outcome. Birth control pills are the most commonly used treatment for regulating periods in those women who are not ready for pregnancy yet, and also pills are effective at reducing extra hair growth. Weight loss is very effective in restoring normal ovarian function. Many overweight women with PCOS who lose 5 to 10 % of their weight will notice their periods become more regular. Metformin is a medication that improves the effectiveness of insulin produced by the body. It is a treatment for Type 2 Diabetes but can also improve menstrual function. Clomid is the most effective medication for achieving pregnancy. It stimulates the ovaries to release eggs in a regular monthly cycle. With proper diagnosis and the right treatment we can achieve excellent results in minimizing the problems of this condition and leading to a normal life with regular menstrual cycles, good birth control and fertility when it is desired. This entry was posted in Gynecology, Our Office and tagged Dehydroepiandrosterone sulfate, Diabetes mellitus type 2, Hyperandrogenism, Menstrual cycle, Metformin, Ovary, PCOS, Polycystic ovary syndrome. Bookmark the permalink.